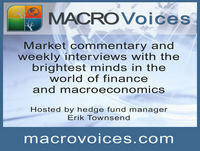 Erik Townsend and Patrick Ceresna welcome David Rosenberg to MacroVoices. Erik and Dave discuss the FOMC policy shift, market topping formation and ask if we are headed for an earnings recession. They further discuss treasury bonds and what is in store for the corporate bond markets. They leave things off by discussing modern monetary theory, helicopter money and Ben Bernanke’s playbook from 2002.